Darkness is closing in on our evening runs so it's time to abandon the trails on Mondays and Wednesdays. Starting next week our Monday run will be the Hamilton Avenue route, and Wednesday we'll run Cochrane Street with the usual optional add-on of Long's Hill. 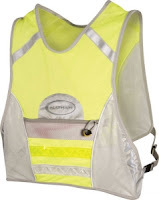 And if you don't have a reflective vest to wear ... GET ONE!